Join us in LA for our 2-day microblading training and get certified to licence your art and turn into a successful business. 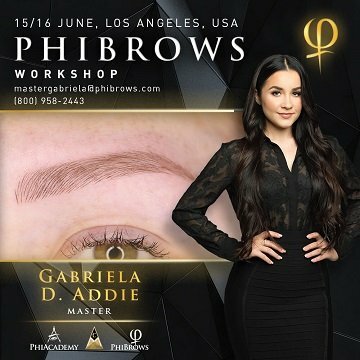 Our microblading training in Los Angeles is a 2-day live event taught by our PhiBrows master artist Gabriela Addie. During the course Gabriela will teach you theory, equipment use, skills and best practices. You will will have a chance to practice on live models. No experience is required for this training, making it perfect for newcomers and established cosmeticians looking to gain new skills. As part of our microblading class in LA, you will receive a premium microblading kit, 6 months of unlimited support from Gabriela and a certificate of attendance from Art of Beauty Academy USA. After the training you will have the opportunity to get a PhiBrows international certificate and license your art which can turn into into a successful high-income business. With this payment option you will be paying for the microblading course Los Angeles in full. After you complete the payment your balance will be $0.00 and we will register you for the course. You will receive an email to confirm this. Therefore, it is considered only as an initial payment. When you complete it, your remaining balance will be $2900, plus a processing fee. Your will have to pay the remaining balance one week before the start date of the class when paying with card or on the day of the class when paying with cash, to finish the registration. The live microblading course in Los Angeles is a comprehensive event taught by master artist Gabriela Addie. In two days you will learn how to microblade by adopting theoretical and practical skills, including practice on live models. Each student at our microblading training Los Angeles will receive a Premium PhiBrows Microblading Kit. PhiBrows is the world’s #1 producer of microblading product. Furthermore, inside the kit you will receive enough tools and products for 80-90 clients. The kit will not only allow you to pass the course and practice, but also treat your first clients with artist-quality products. PhiBrows Certificate is the most notable microblading certification in the world. Once you finish microblading course LA, you only need to pass the 11-level online training via Craft Master App, which you already covered in Gabriela’s PhiBrows training. After the final level, you become PhiBrows certified and an official microblading artist. Getting noticed is hard when you’re starting your microblading career. That’s why as a certified PhiBrows artist you will automatically join the global PhiCommunity. This gets you featured with other PhiBrows artists and masters across the world and let clients find you wherever they may be. Los Angeles has the highest number of microblading artists on the West Coast. But, it also has the highest demand and microblading treatment fees which can go up to $1500 for just one treatment that approximately lasts for 2-hours. In addition, you can market your services across California, and you already received enough supplies with your kit to treat up to 90 clients. So, if you start from $500 per treatment, it would take you just 14 hours to earn back what you invested in training initially. Sounds good? Book your training TODAY!